Sea otter populations in the Aleutian Islands were some of the first to recover following the end of the fur trade. At one time, over 80% of the world’s sea otters lived in this area. Between 1992 and 2000, sea otter populations in the Aleutians declined by 70%. Abundance fell by another 63% from 2000–2003. The rapid decline in sea otter abundance in southwest Alaska has been attributed to an increase in predation by killer whales. In 2001, the US Fish and Wildlife Service (USFWS) designated the Aleutian Islands population of northern sea otter as a candidate species for listing under the Endangered Species Act (ESA). In 2002, they expanded the candidate stock to include all sea otter populations in southwest Alaska. In 2004, USFWS proposed listing the southwest Alaska northern sea otter under the ESA, and in 2005, the population was listed as threatened. 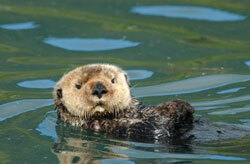 For general information on Northern Sea Otter, see the Northern Sea Otter species profile page.